Barrier Minds are a more durable variant of the Cyclops that appears exclusively in the Bug in the System Adventure. 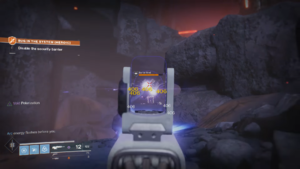 Barrier Minds are designed to prevent Guardians from tampering with the Vex's simulation of the Hive. They fire high-damaging Void mortar blasts with a large blast radius, and upon taking enough damage, they release a barrage of smaller explosive energy blasts when enraged like a Torch Hammer. Their armor plates at the front reduce the risk of damage dealt to them; therefore, shooting their eye is the best strategy. This Cyclops must be killed to obtain an Arc charge that will be needed to disable the security barrier to the simulation to allow The Ghost to sync with it. Every time the Hive cut off the simulation, The Guardian must then go back and kill another Barrier Mind to get another Arc charge to resume the simulation sync.